When Three Dog Night struck gold with "Joy To The World" in 1971, fans worldwide acclaimed their driving pop/rock sound and powerful harmonies. 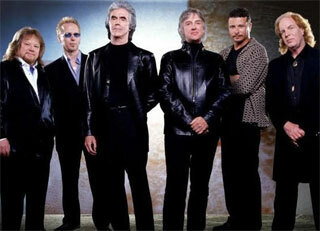 Today Three Dog Night delivers their signature sound to audiences spanning generations. The current Three Dog Night line up features founding members Cory Wells and Danny Hutton on lead vocals as well as original keyboardist Jimmy Greenspoon and Michael Allsup (lead guitar). Paul Kingery (bass), and Pat Bautz (drums) have joined the group since it reformed in 1981 after a six-year hiatus. Brought together originally in 1968 by Danny Hutton, with the novel concept of show casing lead singers who could also harmonize together, the group was enormously successful right from the start. Hutton, who had graduated from loading and unloading records at the Disney studio to recording as a solo artist, had met Cory Wells, while Cory was touring with Sonny and Cher; Danny met Chuck Negron through mutual friends. The group had no hangups about 'doing only their own songs.' They recorded the best new material from the best new songwriters and wound up with fourteen gold albums, nine gold singles and sold over forty million units. Three Dog Night toured extensively during the seventies, breaking attendance records in venues ranging from concert halls to football stadiums. In 1975, however, the rigors of non-stop roadwork caught up with the group. "We became disenchanted," Wells says today, "We just quietly backed out of the picture. We have always had a sort of verbal agreement that we were never going to exploit the public for our own gain. We are not going to do four or five 'fairwell tours' just to rake in the money. We had come on the scene quietly and we were going to leave the same way, with dignity." Hutton, the black-haired Irishman, relaxed awhile at home in Los Angeles, then left for Central America, England, and eventually his home town of Buncrana, Ireland. Danny formed a management/booking agency which thrived. Among those bands he managed was the 'premier punk band' "FEAR" and he booked bands such as the "The Go-Go's" and "X." Recently, he has recorded two songs for motion picture soundtracks albums "Wouldn't It Be Good" for Pretty in Pink and "Brand New Day" for American Flyers. Wells packed his family into an automobile and leisurely toured the United States. An ardent and expert fisherman, Cory traveled the world -- fishing as he went. He is currently a field editor for "Outdoor Life" magazine and writes articles for various sporting publications. Cory has appeared on various television shows such as "American Sportsman" and recently filmed a "Country Sportsman" episode in New Zealand. Although each band member needed to 'get away' from the hectic world of pop music, each began, eventually to feel the need to return. From unfinished business involving the original group got them together again. To their surprise, they found they all shared the same feeling, a resurgence of interest in music and a growing desire to try it all over again. As Danny Hutton puts it, "We just had a test rehearsal and discovered the old magic was still there." Three Dog Night was reborn. Noteable Entertainment & Events is a Vancouver based booking agency, party rental, entertainment services and event production company. If you are interested in booking Three Dog Night please contact us.